Saute onion in 1 tablespoon butter until translucent. Mix all ingredients, except cornflakes and 4 tablespoons butter, together. Put potato mixture into a 9x13 inch baking pan. 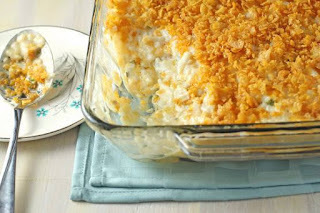 Combine cornflakes and butter, and sprinkle evenly over top of casserole. Bake at 350 degrees F for 40-50 minutes or until heated and bubbly.